This 1-sided FDIC decal is a great solution for those outdoor applications. 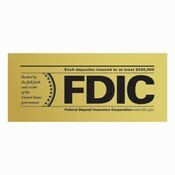 Sticking to virtually anything, this FDIC sticker is great for drive-ups and boxes. 7"w x 3"h to meet FDIC standards.